This is the first season of the Shadow Warriors series with Sonny Chiba. < What I mean is I can download three or four episodes before I get a pop-up on the MEGA site saying I've exceeded my transfer limit for the day. As for subtitles, they are not hard-coded on all episodes. not sure what you mean. there are English hardsubs, and if something wrong with your download you can try different browser or device. No subtitles and MEGA only lets you download 1 episode before it stops you downloading. Ok, my bad perhaps. Get script error from "Mega" when using Internet Explorer. можно было бы загрузить нетронутую DVD5 или DVD9 этот гениальный сериал? Ein Dienst für die Menscheit! Thank you so much for the incredible collection on this site. 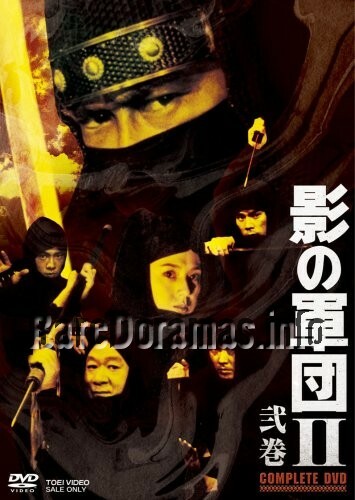 Thx for such a rare drama I've never seen a classic shinobi type dorama before amazing and very rare! All episodes except 1 and 9 have internal English softsubs. Try playing in VLC player. please upload eng sub for all the eps,i really want to watch this. fan of sonny chiba.